The Mercure Hotel Bochum City is just a short walk from Bochum's main train station. 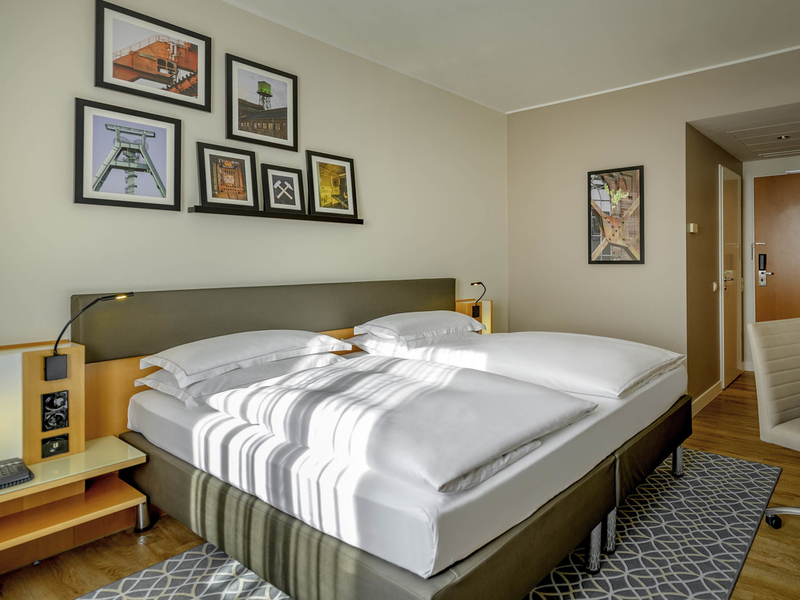 The hotel's two modern high-rise towers are an architectural highlight of the city, the upper floors offering spectacular views over the Ruhr region metropolis. And the c harm delivers on what it promises: The Mercure Hotel Bochum City is the only 4-star hotel in downtown Bochum. All 162 Comfort Rooms are air conditioned and have WIFI. You can park your car in the hotel's secure indoor car park. Bochum is full of surprises! The university town is young and lively, and the Bermudadreieck (Bermuda Triangle) area attracts people from across the region. Even visitors from abroad come here to enjoy an evening of musical theater at Starlight Express. Is a sophisticated atmosphere important to you? Then the Mercure Hotel Bochum City is a perfect choice: You will enjoy 4-star comfort at our hotel - the only hotel in the city center. All 162 rooms are air-conditioned and soundproofed. You have the choice of spacious Standard or Privilege Rooms. Amenities include a safe in the room, a desk and 24-hour WIFI. One child up to 12 years of age can sleep in the parents' bed free of charge. Your pet is welcome for a fee of EUR 7 per night. The Twin Tower restaurant serves up local specialties and international classics, as well as special vegan dishes. The restaurant is open daily from 12:00pm until 10:00pm. If you are not a sports fan yet, you will be once you've visited our Sky sports bar! Open daily from 12:00pm to 1:00am, it is the perfect place to kick back and enjoy a cold beer, refreshing drink or tasty burger and watch the live action. I stayed in Room 1204 , it was Premium Room still The Bath Towel had a Hole in it I used it and then dropped it for washing and opted for new Bath Towel , I again Received a Towel which was Torn from one side . This does not speak of even minimum standard , because a NON Star Hotel India Provides Bath Towels without Hole or Torn One. For my next visit I Would Look for New Hotel in Bochum , I have been staying at this Property for Last 10 Years, ofcourse different ownership but never received such Towels. Best Regards, D K J. The Mecure hotels always offer an excellent service at an affordable price and this one was no exception. The room was clean and spacious and there is a machine for making coffee or tea. There is also an underground car park with direct access to the hotel.My only criticism is the lack of a refrigerator in the room. As always a delight to visit this hotel. The staff are attentive and the check-in process is simple and efficient. Nothing seems to be too much trouble for the staff. Breakfast is always a pleasure to attend with masses of food to select from. The bar is also a delight to visit, with the barmen efficient and polite. Good standard of room; good standard and good choice at breakfast. I always love staying at this hotel, the room was impeccable and the staff were brilliant, my only gripe was that when I checked out, I was charged for the full amount instead of using my Le Club points which is what I had booked with, so it ended up costing a small fortune, but it was soon rectified when I pointed out the mistake! As always an excellent stay at the Mercure Bochum, though this time the hotel seemed to be very overpriced - paying just short of €300 for 2 nights stay. Still the rooms are big and clean and the service is excellent. Excellent service all round and a very pleasant stay. A truly delightful experience when staying at the Mercure Hotel, Bochum. From the moment we checked in to the moment we left we were delighted with the ambience of the Hotel. The desk staff were a joy to speak to and were really efficient with nothing being too much trouble for them. Breakfast was sumptuous and again a delight to experience. After three days we reluctantly had to check out to fly home, but the desk staff were again a delight to speak with. I can't really commend the staff highly enough. The location is excellent and this Hotel is my Hotel of choice when visiting Bochum twice a year. Only complain was bedroom was too warm with temperature difficult to regulate.